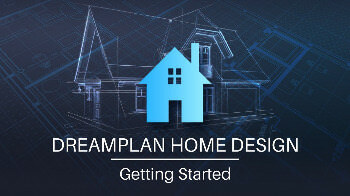 DreamPlan Home Design Software is a user-friendly application whose main function is to provide you with the proper means of creating a 3D plan of your future home, in just a few steps. The program is very easy to work with, featuring several tabs corresponding to the operations you can perform, namely: ‘Building’, ‘Exterior’, ‘Interior’ and ‘Landscaping’. From the ‘Building’ section of DreamPlan Home Design Software, you can create your house from scratch, adding walls of any length you want, that will automatically be placed in straight angles. The utility enables you to select from three types of windows: ‘Classic’, ‘Sliding’ and ‘Panel’. You can also add ‘Interior’ and ‘Exterior’ doors or ‘Door Frames’. DreamPlan Home Design Software allows you to choose the ‘Floor Style’ from several available ‘Textures’, in a color of your prefer. Moreover, you can add a ‘Roof’, with plenty of style options to select from, and adjust its ‘Slope’ and ‘Eave’ levels. Last, but not least, you can paint the walls of your house in any color you want.